With all of the wonderful food websites out there, it’s really not necessary to spend money on cookbooks for great vegan recipes. However, I love my trips to Barnes & Noble and I often find myself drawn to the cookbooks’ section. Since I currently read most of my books as e-books, the only books I will now purchase are cookbooks and study guides for my son. Although I have become somewhat of a cookbook junkie, I find myself using the same five cookbooks over and over again. What makes a great cookbook? For me, it is one with simple recipes requiring very few ingredients. The final results have to be consistently good, as well. What’s the point of having a cookbook in which the recipes have so many ingredients that they will be burdensome to make? Why would anyone want a cookbook where only one out of every three recipes tastes delicious? Beautiful photographs are always an added plus to any cookbook. “The Candle Cafe Cookbook” is my #1 “go-to” cookbook. I bought the book while dining at the Candle 79 restaurant many years ago (long before I became a vegan) and have been loving it ever since. Why? This cookbook contains very basic recipes which are bound to become staple dishes in your home. 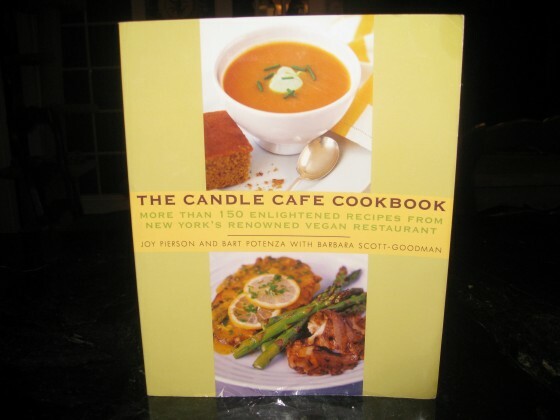 The Candle Cafe is my favorite casual vegan restaurant and these recipes reflect the dishes that are served there. The recipes are simple, require few ingredients and are easy to follow. I love the recipes for the Tempeh Reubens, Candle Cafe’s World-Famous Split Pea Soup, Garlic Mashed Potatoes and Seitan Piccata With White Wine and Caper Sauce. 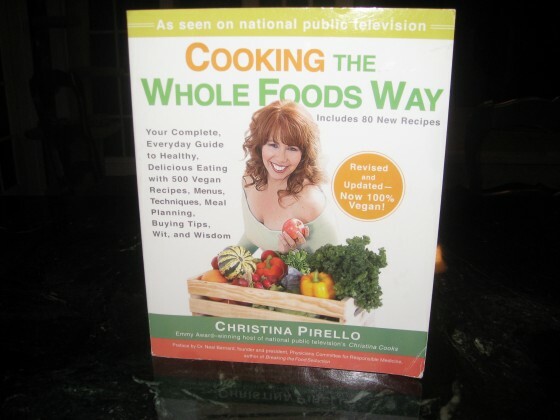 Christina Pirello is an Emmy Award-winning host of the national public television show “Christina Cooks.” In 1984, she was diagnosed with terminal cancer and given six to nine months to live. Ms. Pirello regained her health through a macrobiotic diet and married her macrobiotic coach, Robert Pirello. Clearly, she knows something about taking control of your health with food! 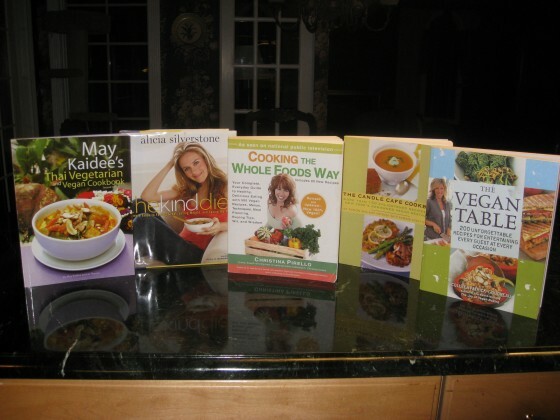 I consider her fabulous cookbook “Cooking The Whole Foods Way” to be a vegan version of the Betty Crocker cookbook. It is filled with everyday recipes including amazing sauces, soups, entrees, side dishes, salads, salad dressings and more. I can only describe this book as a “reliable old friend” since every one of the numerous recipes I’ve tried has been amazing. I make Christina’s minestrone soup at least once a week in the fall and winter months and her sauces are my staples. Colleen Patrick-Goudreau is sort of like a Martha Stewart of veganism. I was really excited to see her speak at “The Seed: A Vegan Experience” in New York City this past summer. No one presents the reasons for going vegan better than Ms. Goudreau who astutely pointed out during her lecture that hospitals don’t have kwashiorkor wards for a reason. For the record, kwashiorkor is a disease of protein deficiency and the diseases of our culture (cancer, diabetes and heart disease) are partly caused by excesses of protein and not deficiencies. 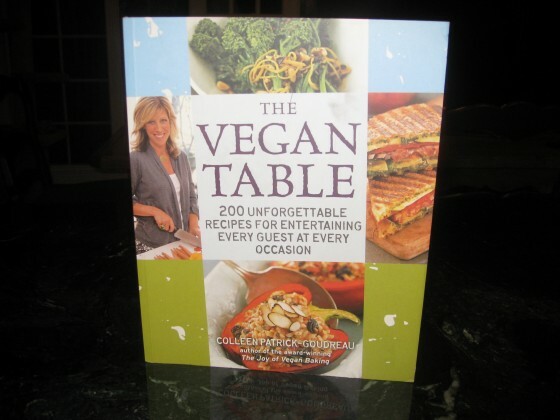 Why do I love “The Vegan Table?” The Vegan Table is a beautiful and enticing cookbook with large print and beautiful photographs which make it easy to follow the recipes. The book is filled with “Compassionate Cooks’ Tips” (such as how to prevent onions from sticking to the pan while sauteeing) and other tidbits of useful information. I learned all about vegan wines and beer from this book. My favorite recipes are the Tofu-Spinach Lasagna, the Harvest-Stuffed Acorn Squash and The Eggless Egg Salad. “The Kind Diet” holds a special place in my heart since it was one of the first books to introduce me to veganism. In her book, Ms. Silverstone clearly sets forth every reason under the sun why going vegan is beneficial to your body and to the planet, and she does it in a compassionate and non-judgmental manner. She divided the recipes into three sections: “Flirting,” “Vegan” and “Superhero” (which most may define as “macrobiotics”). 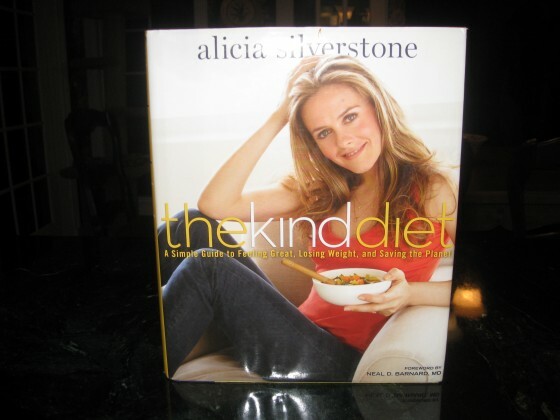 Why do I love the recipes in “The Kind Diet?” I love the recipes because they are user-friendly, simple and basic. Alicia’s Crispy Peanut Butter Treats with Chocolate Chips are the “beating heart” of my home. The “Superhero” recipes introduced me to the world of macrobiotics. 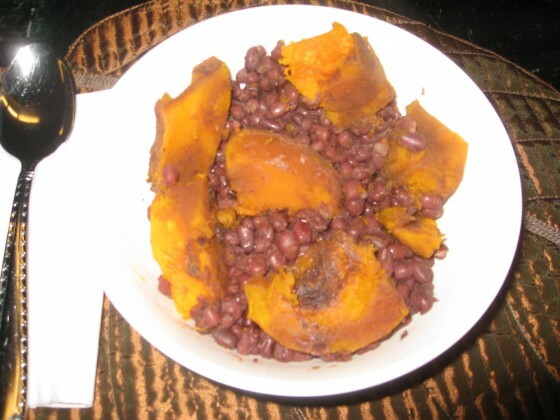 I make the nourishing Azuki Beans with Kabocha Squash at least once a week in the fall and winter months. My brother bought me this cookbook as a gift while he was vacationing in Thailand where he took a cooking class at May Kaidee’s school in Bangkok. 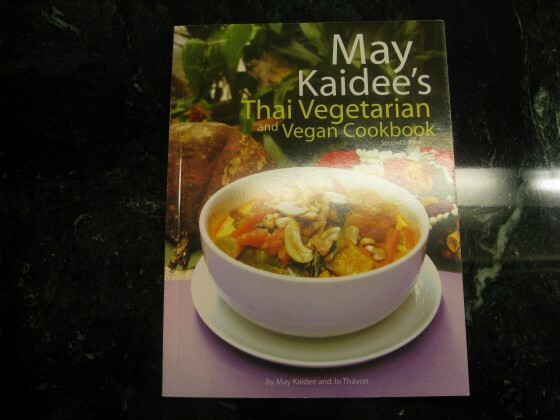 I highly recommend this book which you can purchase from May Kaidee’s website if you want to cook Thai food in your own kitchen. For the record, my brother thoroughly enjoyed May’s cooking class which you may want to take if you happen to be vacationing in Thailand. One can only wish! Why do I love this book? The recipes are super easy, the photographs are awesome and I absolutely LOVE anything made with coconut milk and red chili paste! My favorite recipes are the Panang Curry and the Tom Kah Soup. Nice list of books, Debby. We’ll compare notes. This sounds like an excellent one!!! TY soooo much for sharing!